One of our customers has completed JN0-102 Juniper Networks Certified Internet Associate, Junos(JNCIA-Junos) exam, and he came to ask if he can take JN0-420 JNCIS-DevOps exam. Please note, on 10/1/2018, JNCIA-DevOps exam becomes the prerequisite for the JNCIS-DevOps certification. Prior to 10/1/2018, the JNCIA-Junos certification will remain the prerequisite for JNCIS-DevOps. If you meet the requirment above for JNCIS-DevOps certification, now just take JN0-420 exam questions to complete Automation and DevOps, Specialist (JNCIS-DevOps) exam. 1. Click the Exhibit button. Referring to the exhibit, which exception is raised if the <get-interface-information> RPC tasks 40 seconds to return a complete response? 3. In SLAX, what is the difference between the jcs : invoke ( ) and the jcs : execute ( ) functions? A. RPCs called by jcs : execute ( ) are executed within an existing connection. B. RPCs called by jcs : execute ( ) are not executed until the conclusion of the script. C. RPCs called by jcs : invoke ( ) are executed within an existing connection. D. RPCs called by jcs : invoke ( ) are not executed until the conclusion of the script. 4. You have created an on-box script and want to deploy it on your device. You plan to place it in a directory where the Junson OS can execute it. 8. Click the Exhibit button. 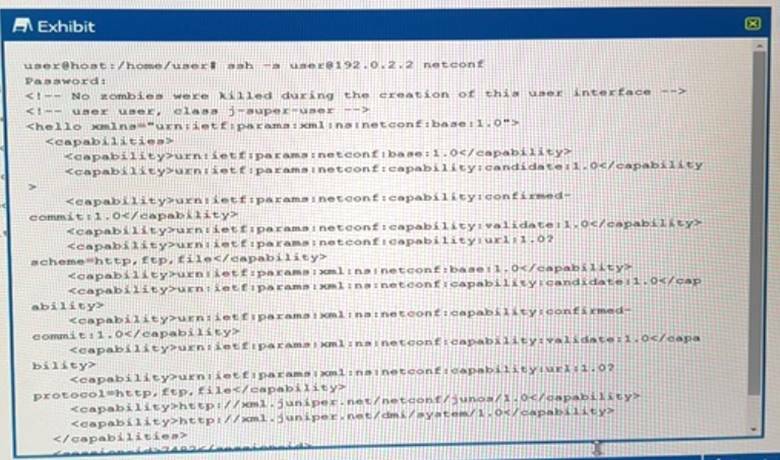 While using NETCONF, the developer attempts to lock the configuration, but the error shown in the exhibit is received. The developer verifies no one else is configuring the device. 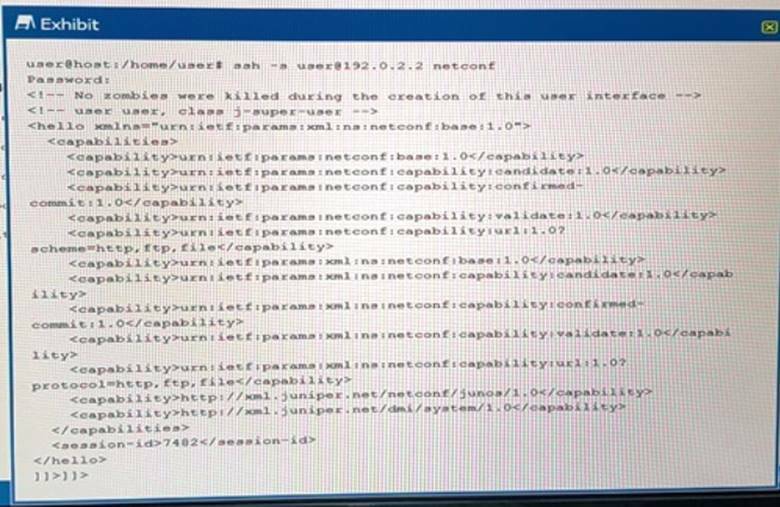 According to Juniper, how would you clear the error in this scenario? A. Log in with another NETCONF session, reboot the instance, and save the original configuration. B. Log in with another NETCONF session and enter the <rpc><kill-session>< session -id>user02</session-id></kill-session></rpc]]>]]> command. C. Login with another NETCONF session and enter the <rpc><kill-session>< session -id>8099</session-id></kill-session></rpc]]>]]> command. D. Log in with another NETCONF session and enter the <rpc><close-session>8099</close-session><rpc>]]>]]> command. 9. Click the Exhibit button. 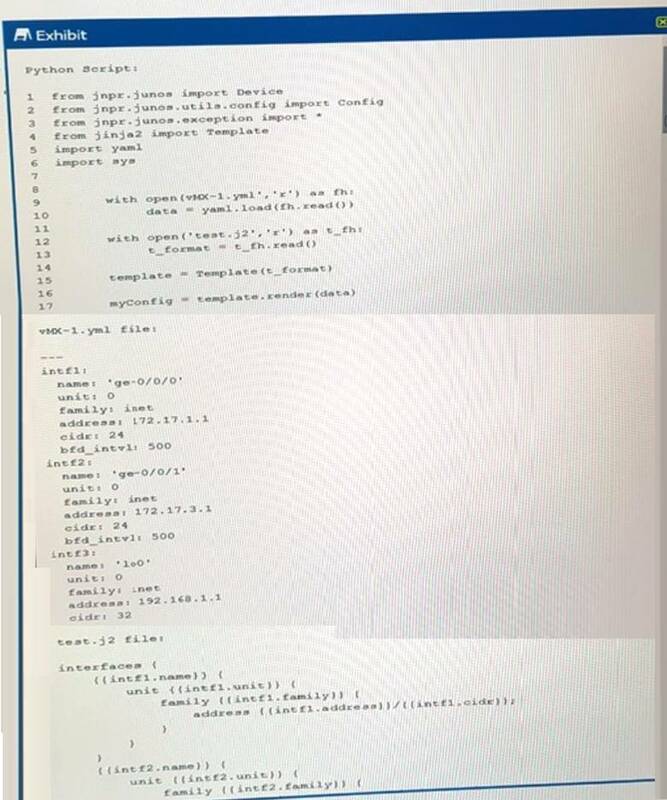 Referring to the exhibit, what is the type of the myConfig variable on line 17 of the Python script? 10. To which component(s) does the JET service APIs provide access? 11. The <rpc-reply> XML tag is a member of which NETCONF protocol layer? 12. Click the Exhibit button. An automation developer is using command-line scripting and wants to briefly survey NETCONF capabilities before running a new task. 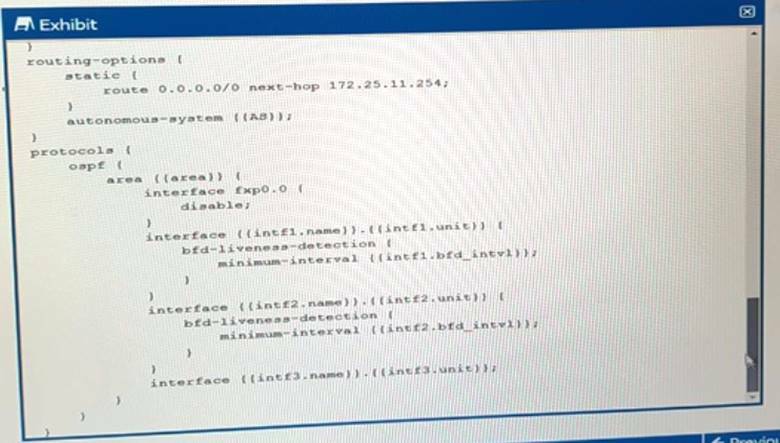 Referring to the exhibit, how does the automation developer end the current NETCONF session and go to the next one? A. Use the <rpc><kill-ession><kill-session></>pc> command. B. Use the logout command. C. Use the <rpc><kill-ession></close-session></>pc> command. D. Use the quit command. 13. Click the Exhibit button. You are using RubyEZ to interface with a Junos device, however, you are not successfully connecting to the device. Referring to the exhibit, what is the problem? D. new statement arguments must be hashes. 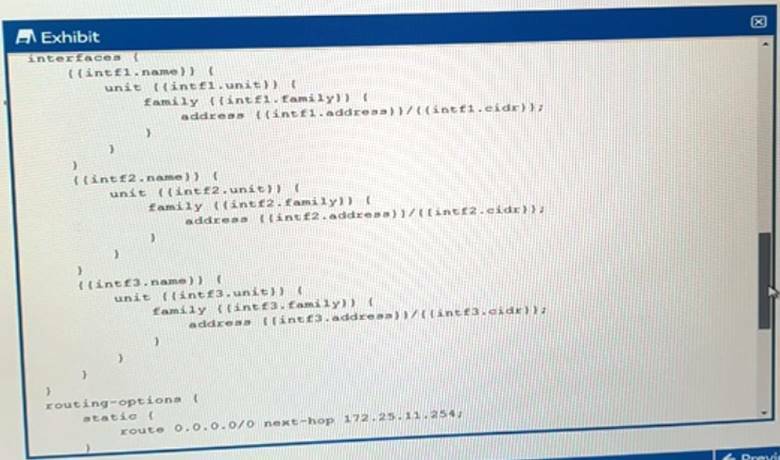 F. new statement only expects an IP address of the target device. H. new statement must be referenced as variables. 14. You are asked to write an application that interacts directory with the internal APIs belonging to rpd. A. You must write the application using the REST APIs. B. You must write the application using the XML APIs. C. You must write the application using the YANG APIs. D. You must write the application using the JET APIs. 16. What is a correctly formatted JSON string? 18. You are writing a SLAX op script to provide a customized rendition of the show interface output. You want to include a command-line argument named interface and provide it whit the default value of fxp0. 20. What is a valid method for determining the Junos RPC associated with the show version command?